2018 Reissue with New Cover Artwork! MF DOOM is the man in the iron mask. The most mysterious figure in hip-hop has also become one of the most popular, supplying beats and rhymes for Gorillaz, De La Soul, Madlib, Danger Mouse, and Wu-Tang Clan, and drawing praise from heavyweights like Just Blaze, Nas, and Mos Def. Since 2002, DOOM has released numerous volumes of Special Herbs, one of the longest-running instrumental series in hip-hop history. Now, volumes three and four of the acclaimed series are available on vinyl for the first time in years. 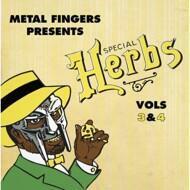 With obscure loops and dusty samples galore, Special Herbs Vol. 3 & 4 is a must-have for any DOOM fan or hip-hop head.